Refined poses and perfect composition. 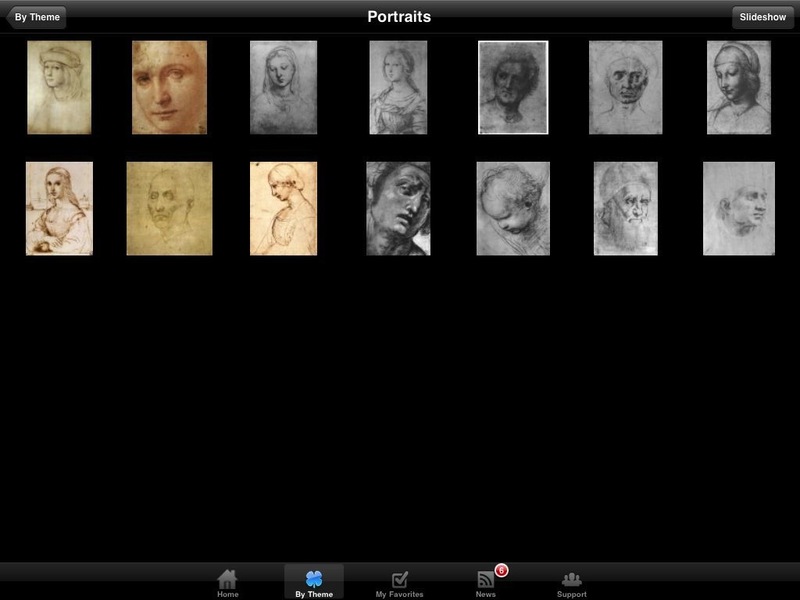 In this FULL VERSION, designed for iPhone® and iPad®, you will find over 100 drawings by the great master Raphael. Enjoy the high quality images of his drawings, share them with your friends via email, and learn about the artist life. 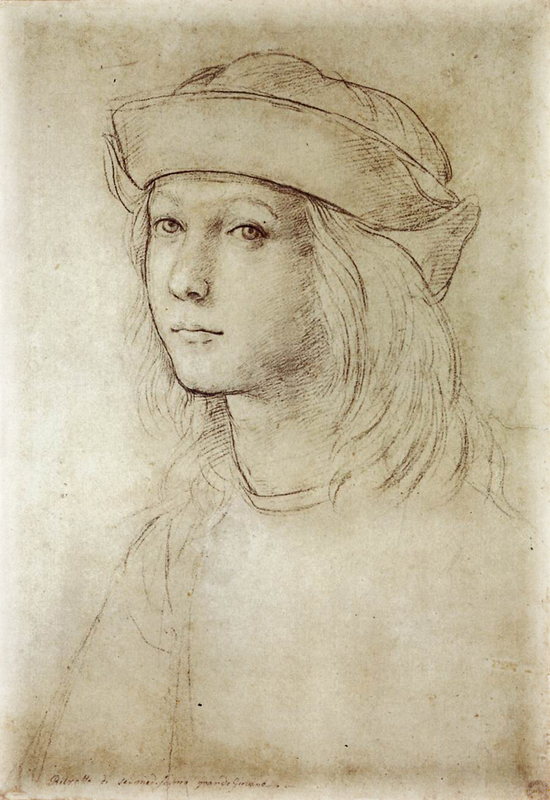 Raffaello Sanzio da Urbino (1483-1520), better known simply as Raphael, was an Italian painter and architect of the High Renaissance, celebrated for the perfection and grace of his paintings and drawings. 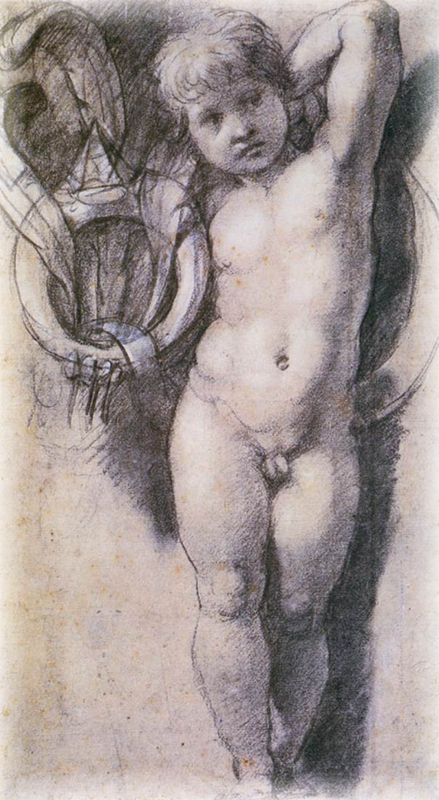 Together with Michelangelo and Leonardo da Vinci, he forms the traditional trinity of great masters of that period. Raphael was one of the finest draftsmen in the history of Western art, and used drawings extensively to plan his compositions. 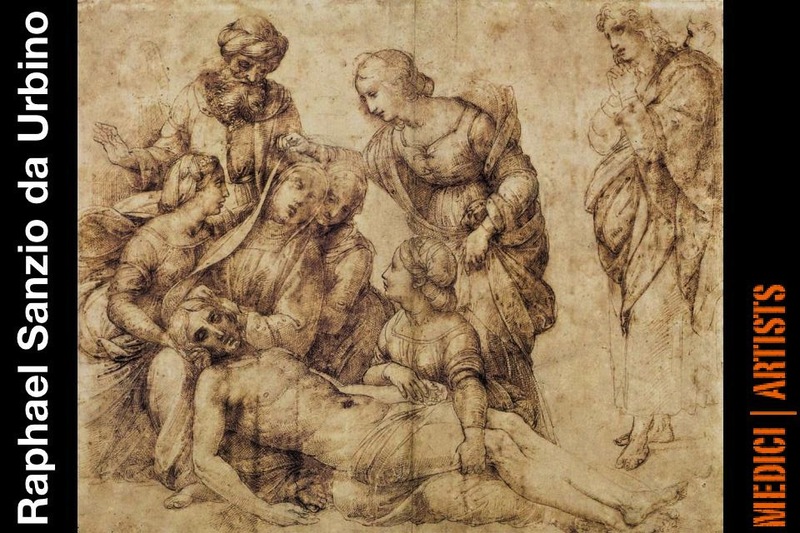 When beginning to plan a composition, he would lay out a large number of stock drawings of his on the floor, and begin to draw “rapidly”, borrowing figures from here and there. Over four hundred sheets of sketches survive altogether. He used different drawings to refine his poses and compositions, apparently to a greater extent than most other painters, to judge by the number of variants that survive. 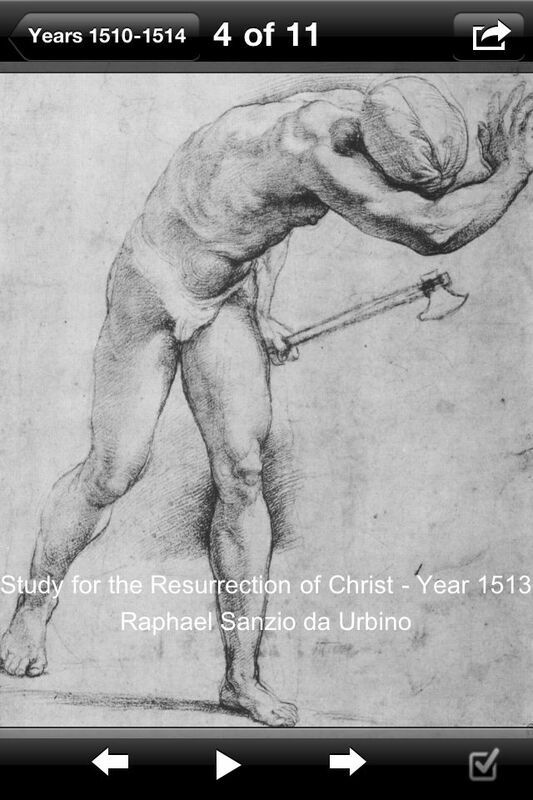 Most Raphael drawings are rather precise—even initial sketches with naked outline figures are carefully drawn, and later working drawings often have a high degree of finish, with shading and sometimes highlights in white. 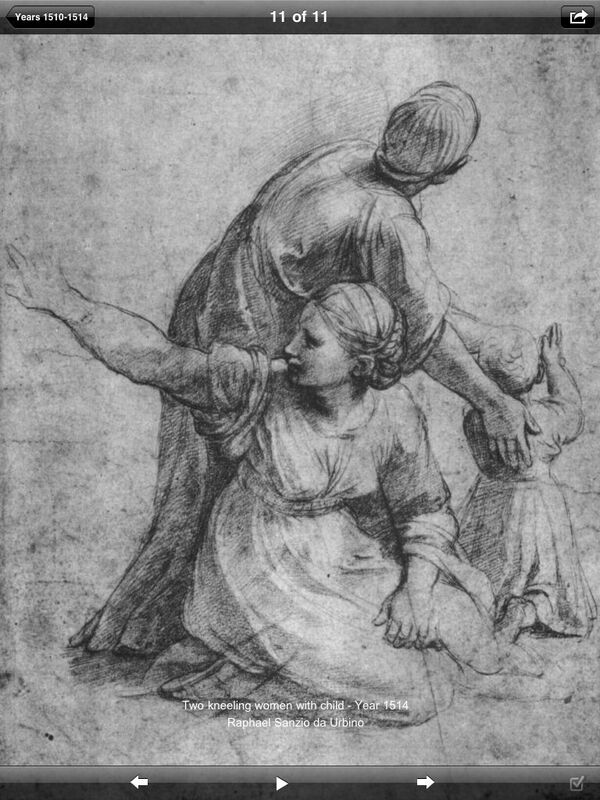 They lack the freedom and energy of some of Leonardo’s and Michelangelo’s sketches, but are nearly always aesthetically very satisfying. 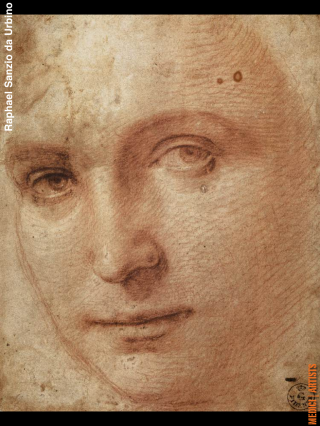 He was one of the last artists to use metalpoint (literally a sharp pointed piece of sliver or another metal) extensively, although he also made superb use of the freer medium of red or black chalk. 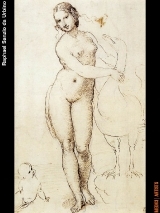 In his final years he was one of the first artists to use female models for preparatory drawings—male pupils (“garzoni”) were normally used for studies of both sexes. 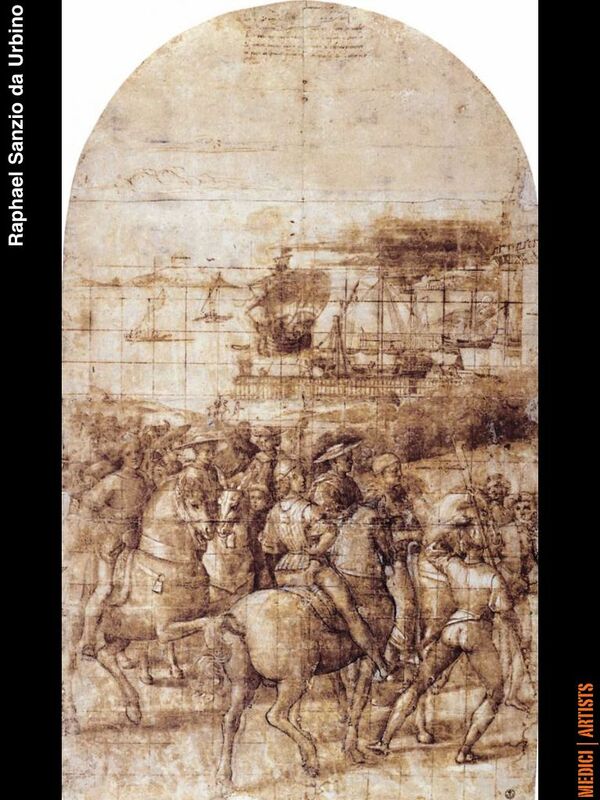 This app dedicated to Raphael Sanzio da Urbino offers more than a 100 works of one of the most renowned artists of the Renaissance. Varying from study drawings to popular works, this app provides a reminder as to why Raphael was indeed one of the most notable figured of his time. The high resolution images serve proof of his expertise in lines and composition and the app is a rare treat of his contributions to art. I can’t imagine any art-lover not loving this app. 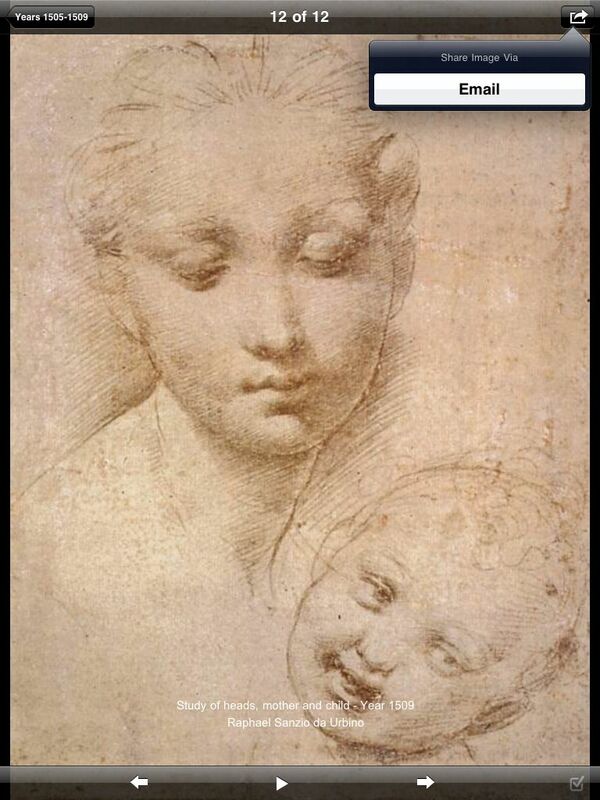 Though more images would have only made this app even better, the works compiled in this app provide a thorough introduction of the genius of Raphael. 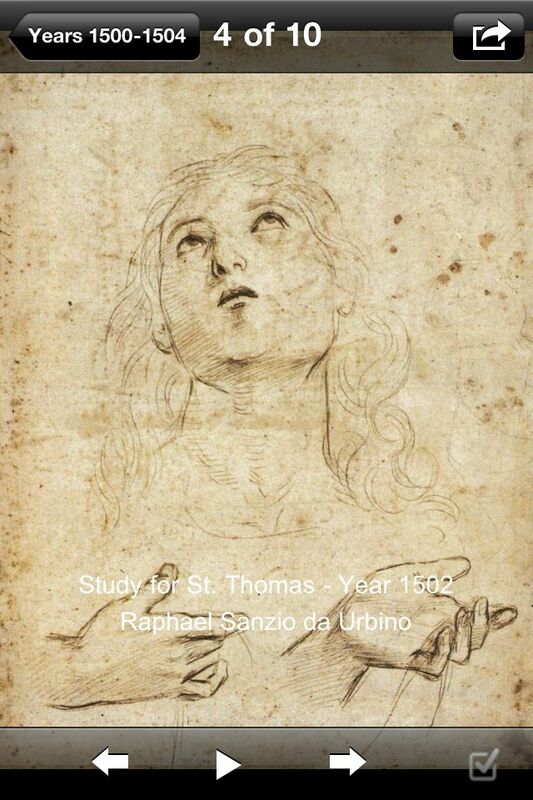 Thus, this app is a wonderful introduction for those that even have a mere interest in Raphael while also providing access to works that simply cannot be found anywhere else. 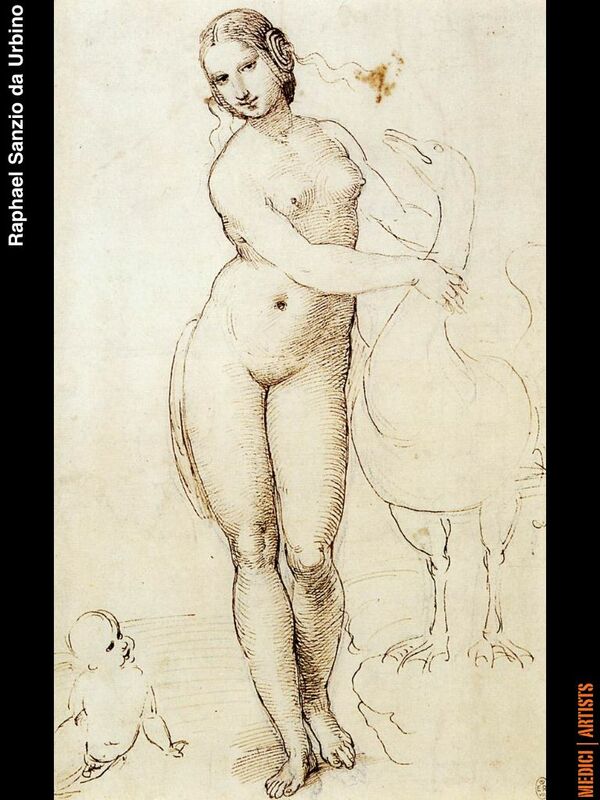 Whether an expert or a mere beginner in the works of Raphael, this app is perfect for ALL art lovers, despite where one may lie on the spectrum! One of my favorite apps ever! As someone who simply appreciates the beauty that surrounds her, this app introduced me to the world of art and the beauty that engulfs it. 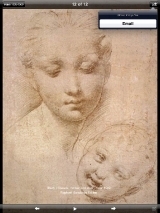 Raphael is truly notable for a reason, as shown by the compilations/drawings offered in this app, while reminding the viewer why he is such a great source of inspiration. For inspiring artists out there, this app is a wonderful reminder that great art takes time, study and patience to create. A must have for anyone and everyone! The app is a wonderful reminder as to how brilliant Raphael was. The illustration and sketches that are available are rare to get access to. 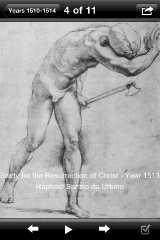 Great opportunity to do thorough analysis such as how this work really competes with other Renaissance artists particularly his greatest rival, Michelangelo. 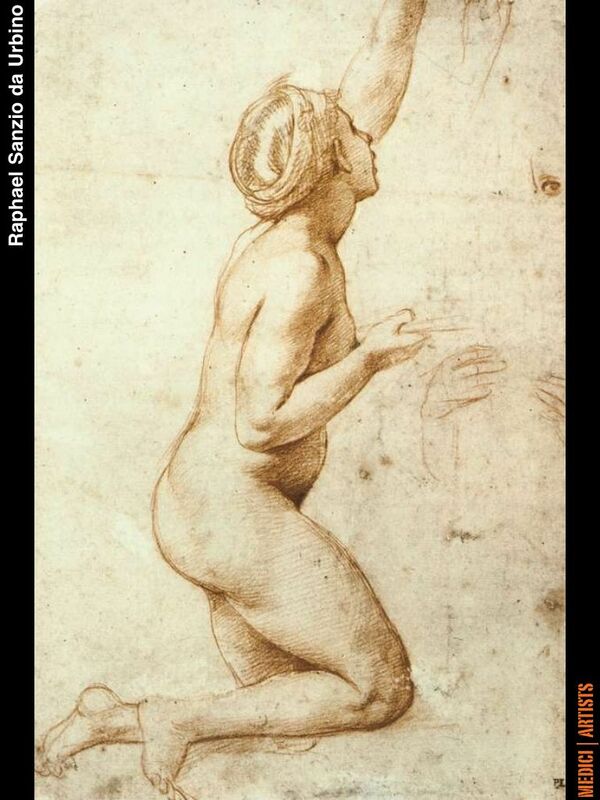 Great app for any use art or Michaelangelo related! The app is a wonderful reminder as to how brilliant Raphael was. The illustration and sketches that are available are rare to get access to. 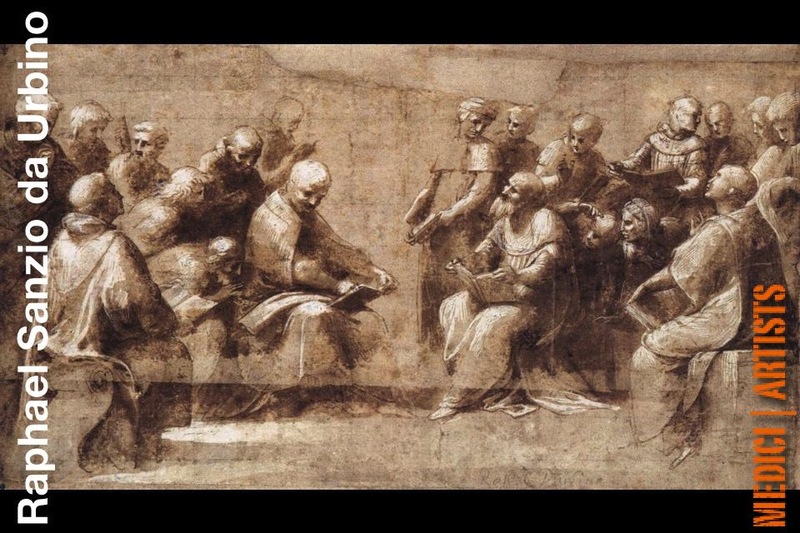 Great opportunity to do thorough analysis such as how this work really competes with other Renaissance artists particularly his greatest rival, Michelangelo. 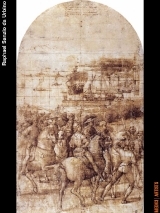 Great app for any use art or Raphael related! Thanks to this app, and thanks to the quality of the images, you will feel a tactile experience in his style. 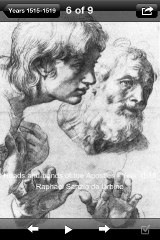 From tone to texture, you can really see the attention Raphael gave to detail. This app is a witness to his drawings, outlines and studies and they will leave you more inspired than ever! It’s an that you will certainly enjoy! Leave a Reply to Dan Q.